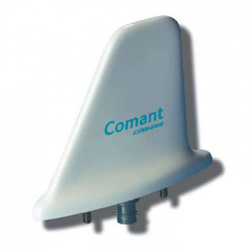 The Comant CI-105 is broadband and rugged antenna designed for DME or transponder use. Antenna assembly encased in a glass reinforced polyester molded shell. Standard two stud mounting configuration. CI-105 includes a BNC connector. Black-chromed, conical stainless steel whip. Elegant transition between whip and mounting surface due to slim-line mount. Stainless steel X-mount with M6-thread whip-fastening system. XP4-mount with 4 m cable and FME-connector (oblong).